We’d just like to take this short opportunity to thank everyone that contributed to the Crew, District and Scouting during 2016. It’s been a rollercoaster of a year for the Crew, but despite the growing pains that came from restarting as a District at the beginning of the year we were happy that we had the chance to work with your Cubs and Scouts, particularly the new opportunity we’ve had to work directly with all the Leaping Wolf Cubs! We would also like to thank the various 3rd parties that have been instrumental in our various projects throughout the year: our awesome neighbours, the 1st Milnerton Sea Scouts and Smart Start Montessori Playgroup, the Messengers or Peace international project and Be Safe Paramedical, Patch Up Medical, The Pole Yard, Neill Zaaiman Civils, Rabie Property and Master Organics for their various offers of support and assistance. Above all else, 2016 has been a year that we have had the opportunity to meet new people, and learn from the various groups in the CW12 District, and other Rover Crews in the Western Cape and Gauteng. What is most apparent is that behind every Cub and Scout, there is an entire network of parents, grannies, Scouters, friends, volunteers, teachers, etc. that contribute to a child who will eventually become a self-sufficient adult, part of our society. As part of this journey, we all impart part of our personalities on these children – they learn our morals and values, they learn to appreciate diverse worldviews and gain interests in multiple areas – this is the greatest gift we are able to give the children that pass through our care in Scouting. It also poses a challenge to us to use this influence in a positive way, and to try give this gift to children who may not have the same opportunities and experiences we’ve all been blessed with. Let’s make this part of our resolutions for 2017 – we all have the superpower to shape the next generation! 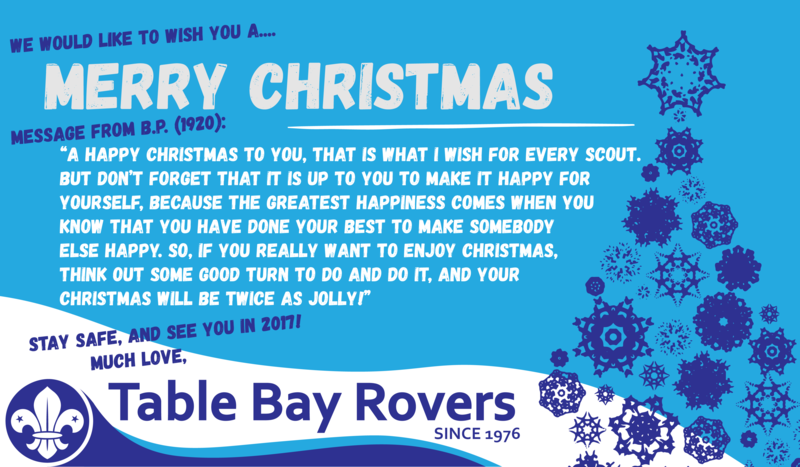 A Happy Christmas to you, that is what I wish for every Scout. But don’t forget that it is up to you to make it happy for yourself, because the greatest happiness comes when you know that you have done your best to make somebody else happy. Have a wonderful holiday season! We hope to see you all for another fulfilling year of Scouting and Rovering in 2017!